The Home Automation Remote is the ideal application for the Home Automation professional who sells Vantage Controls Systems, as well as for the 'techie homeowner' who owns a Vantage Infusion System or a Vantage Qlink system. Through the home wi-fi connection, you can operate the lights while within the home, and communication over an external internet connection allows you remote control of the lights from anywhere with internet access. The application includes up to 10 flickable pages of personalized keypads that can have up to 8 buttons. These are easily programmed to mimic the home's existing button presses to control lights, motorized shades/drapes, thermostats, audio/video, pools, spas, etc. Almost anything that can be done on a keypad or touchscreen can be controlled from this remote, and programming it is as simple as entering the buttons' VID or String numbers. Create buttons to turn on preset lighting scenes, to turn off all lights in the house and to set thermostats to a determined temperature. Create a home scene button, and buttons to control the spa, so the homeowner can come home to a lit house and warm jacuzzi. Even set up HOME and AWAY buttons, with real-time feedback so you know that the command has been sent! You individually label each keypad and button so each page is not only personalized to fit the homeowners specific needs, but it is extremely simple to understand and operate! With options for both internal and external control of the system, it's as easy as entering IP addresses to begin communication with the controller from within the home, or from miles away. And after this information has been entered once, it is stored into the device and will automatically connect to the system when app is launched. Because this is a Lite version, you cannot view cameras, audio/video cover art, or obtain thermostat temperature, or use a dimmer function, but you can still control these as you would from a keypad: enable on/off commands, volume control of audio video, set temperatures, increase/decrease temperature set points, etc. For additional screen shots and easy instructions on how to program both the Infusion and Qlink apps, please click on the Programming the App link at the top of the page. PLEASE LEAVE FEEDBACK ON THE APP PAGE IN THE iTUNES STORE!!! Please do not update to OS5 as we have not verified correct usage with our app. Buy on iTunes right now! 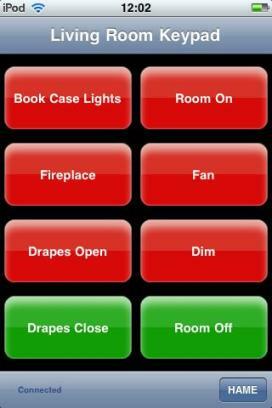 Watch the video below to see how you can use our app to control your lights, shades, fireplaces, sprinklers, and more! From your iTouch, iPhone or iPad! !